Okay, my suspicions are roused at this story. Sunil Ali, the man who allegedly killed Hope Arismandez was found hanging in his cell after being arrested and charged for the murder. Prison sources said that Ali, 28, was found hanging from a line in the cell and bleeding from one of his wrists, which had been slit. This from the Express. (The Guardian has stated his throat was cut). Now, all accounts show that this prisoner was kept separate from other inmates and also on a suicide watch. I can only conclude that he died because the prison authorities (as usual) were unbelievably inept in doing their job protecting this man, or that they themselves are somehow responsible for his demise. Arguably, there is strong evidence to show that he may indeed be guilty, such as leading the police to the body etc, but he - like anyone else - is entitled to a fair and just trial. I am wondering how a man on death watch can find an item to hang himself and also something with which to cut throat/wrist. 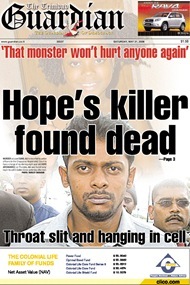 Indeed, if wrist or throat is cut, how could he then hang himself? Or, if he hung himself first, can he indeed have the energy to cut himself while strangling? 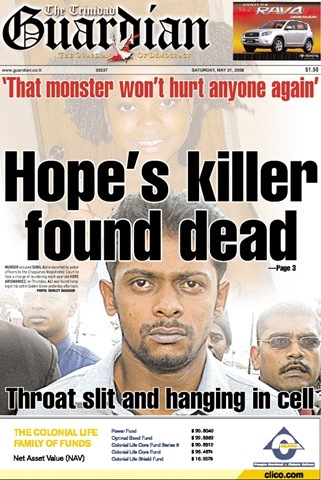 His death is a further sign of the anarchy and breakdown that is Trinidad and Tobago.